Bon vivant and Barneys creative ambassador-at-large Simon Doonan knows him some fashion. He also knows him some soccer. This summer, his two passions come together in his latest book, SOCCER STYLE: The Magic and Madness. The cultural man about town chatted with Kicking + Screening about the best uniforms, the cult of uniformity, and and why bad taste is actually good. Doonan talks soccer style, along with Shawn Francis, Lucas Shanks, and Calen Carr, on Wednesday, May 23. Get your tickets here. K+S: Let’s get right to it: What’s your all-time favorite football jersey from a style perspective? Why? I am also a fan of demented car-crash over-the-top shirts. I cheered when Norwich had their "egg and cress” moment. I loved the Arsenal “bruised banana” shirt in the 90’s. Not every shirt needs to be tasteful. As Diana Vreeland said, “Bad taste is a good thing. It’s like a nice splash of paprika." K+S: Why do European footballers look so damn stylish all the time? Doonan: European lads see vanity as a life-affirming thing, and they have a much easier relationship with designer clothing. The Brits still worry that spending too much time in Gucci is going to compromise their masculinity and cause their willies to fall off. K+S: What’s your favorite football film? Why? Doonan: I love an indie doc, but the mega documentary about Cristiano Ronaldo was revealing and quite melancholy. It offered a haunting glimpse into the psyche of a dude who is globally recognized but strangely unknowable. K+S: The World Cup is coming up this summer. You ya got? Doonan: A few months back Gareth Southgate announced that the WAGS would be welcome in Russia. They have been absent since the crazy days in Baden Baden back in 2006, when they generated hilarious press and major distraction. I am ready for a good WAG moment. It would take the edge off the anxious Russia situation… or maybe add to it. 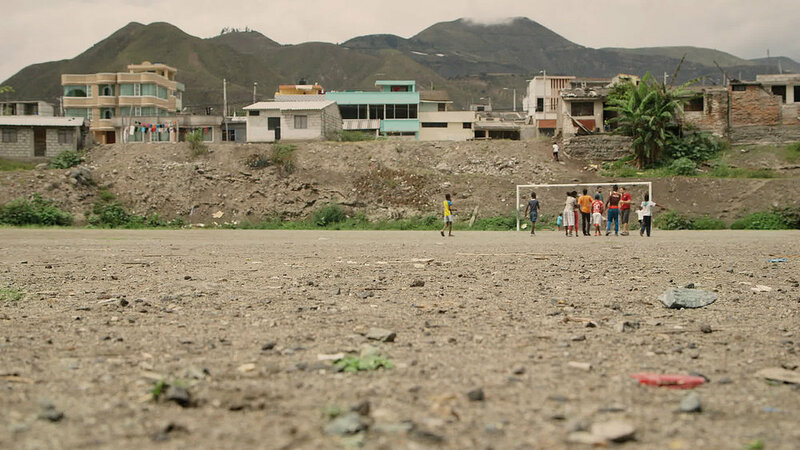 In American Fútbol, four friends travel through Latin America on their way to the 2014 World Cup in Brazil. The group covers more than 7,000 miles, meeting people along the way and finding the heart of soccer in the Americas. Kicking + Screening talked with directors Peter Karl and Petar Madjarac about the film. The world premiere of American Fútbol is at Kicking + Screening on Friday, May 25. Get tickets here. K+S: What was the inspiration for American Fútbol? It feels like the kind of thing that four friends all over the world discuss doing over beers but never actually make it happen. It pretty much happened just like that, a conversation over beers that led to an adventure of a lifetime. We've all been friends for a long time (all went to college together), and after the 2010 World Cup, our friend Sam (featured in the doc) threw out the idea of doing a road trip through Latin America on the way to the World Cup in Brazil. We thought it was a crazy idea, but as beers kept flowing, it became a better and better idea. We realized with the two following World Cups being in Russia and Qatar, this was really our only chance to do something like this. The next day, we started in earnest in preparing for the trip, and countless video chats later, and we were ready to go. K+S: American Fútbol has a lot of familiar themes in documentaries: road trip, buddy movie, football. How did you make it feel like it was it’s own unique film? We wanted our film to be as authentic as possible. So the approach from the beginning was to immerse ourselves in the countries we visited, and let the subjects tell their own stories. Since we jumped around to so many different places, we felt it was important for us as characters to be the connective tissue between the stories. But we never wanted to be the focus. We knew the people we'd meet and the stories they'd share would be much more interesting. That allowed us to focus on connecting with these people, and being alongside them for the ride gave us a unique perspective into their world. The interesting thing we discovered was that so many of these stories had a similar thread of humanity within them. Soccer was just the thing that brought those common human elements out of each one. K+S: How did you pick where you went? Did you have a story in mind as you went along or did you let the people you met and the stories you found guide you? Our goal was to go to all the Latin American countries that qualified for the World Cup in Brazil. Unfortunately, the only one we didn't make it to was Honduras. But including the U.S., there were 10 countries from the greater American continent competing in Brazil. This was really Latin America's World Cup, so we thought it was the perfect chance for us, as Americans, to listen and learn from people who have the greatest direct impact on the growth of soccer culture in the U.S. So in each place we looked for stories that we felt related to us as Americans, and an American audience. Some stories like David Patey, the American owner of C.S. Herediano in Costa Rica, we pre-produced and planned out ahead of time. Other stories like the blind soccer team in Colombia, we discovered on our trip. We wanted to be as prepared as possible going into the trip, while still allowing for things to happen naturally along the way. K+S: What’s a favorite story or scene that didn’t make it into the final cut of the film? In Ecuador, our story explores how their national team broke down racial, regional, and economic barriers in a country as diverse as the continent of South America itself. We share the story from the point of Ulises de la Cruz, one of Ecuador's most famous players, who lifted himself out of poverty to play in two World Cups and now represents his home region in the National Congress. When we visited his village, we profiled a 15-year-old man-child named Michael Chala who hoped to follow Ulises's footsteps and use his football talents to lift his own family out of poverty. We kept footage of him in the film, but we had to cut his storyline and interviews with him and his mom out of the film for timing and pacing reasons. They were emotional interviews too (and Michael said he wanted to play in the U.S.! ), but ultimately couldn't fit in. Regardless, we think the major themes in that section still come through pretty well. K+S: The next World Cup is this summer. Who ya got? Petar: It's hard not to pick Germany again. Their roster is so deep with experience and youth at all positions, but I have a feeling that Brazil will find a way to learn from their mistakes in 2014 and lift the World Cup trophy in Russia. My dark horse is Serbia. They always have a talented roster but never seem to find a way to play together as a team. This year will be different! (Being from Serbia may give me a slight bias here). Pete: I agree, you're silly not to say Germany. But I'm also hopeful that the World Cup trophy can return to South America. The storybook final has to be Brazil-Germany and I'd hope Brazil gets their redemption. Also, don't sleep on Spain. They're so skilled, have a good mix of veterans and hungry young guys, and they're group is pretty weak. If they catch fire, they'll be hard to beat.